Stretching across three impressive condo towers (Somerset House I, Somerset House II, Parc Somerset) and 17 landscaped acres, Somerset House is as grand and luxurious as anything you’d expect from the DC Metro area’s tony Friendship Heights neighborhood. Here, you’ll find everything you need to live your best life, including door men and valet parking, a pet-friendly policy, indoor and outdoor pools, several areas for al-fresco (and indoor) entertaining, a state-of-the-art gym, courts for pickup games of racquetball or tennis, and a boardroom. As for the units themselves, you can choose from unique floorplans, some of which stretch up to more than 4,000 square feet of living space. 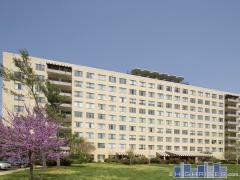 Select units include terraces, stainless steel appliances, and hardwood flooring. Step outside your home and you’ll find yourself right on Wisconsin Avenue, one of the most exciting strips for shopping, dining, and good times. Just a few of the places at your fingertips: Tiffany & Co., The Capital Grille, The Cheesecake Factory, Whole Food Market, Saks Fifth Avenue, Chevy Chase Recreation Center, Mazza Gallerie, and Joy of Motion Dance Center. Plus, you’re right near the Friendship Heights Metro station, which makes commuting downtown (or throughout DC) all the easier. Have any comments or questions about Somerset House? Ask your question and/or share your thoughts about this Building.